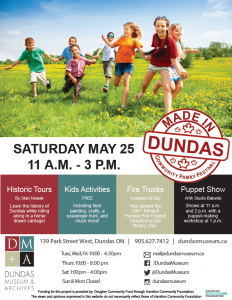 Made in Dundas Community Family Festival returns on May 25 from 11am – 3pm. The day will include a full roster of free activities and crafts for families and kids of all ages. Annual favourites such as horse drawn carriage rides with Stan Nowak, antique fire trucks, and face painting will all be back with the addition of new special features.